Involvement in the full process in delivering SCR assessments, from model inputs, model runs, output production, and interpretation and presentation of results. Analyse data and apply judgement in order to produce and/or challenge parameters for the Internal Model. Perform a key role in producing deliverable as part of the Internal Model Approval process for the Syndicate. In the future the role may demand some occasional overseas travel to the Company’s European branches and/or the United States. The individual will have strong technical and communication skills, and will have had some exposure to actuarial projects relating to modelled capital requirements. Technical model development experience is desirable but not essential. The candidate will be interested in developing into a ‘commercial’ capital modelling role, with focus on building relationships and presenting to underwriters, risk managers, corporate actuaries, IT and financial staff in addition to senior management. They will be equally confident in writing reports, analysing data and making recommendations to improve processes. Self-motivated, able to exhibit critical thinking and exhibit a high level of problem-solving ability. The individual must be proactive in developing and challenging current work processes and models and be aware of professional and technical developments in the general insurance field. They will be diligent, hard-working and able to deliver to tight deadlines and be capable of managing multiple tasks/projects simultaneously. 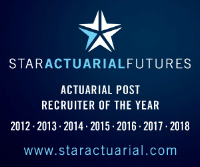 Nearly/newly qualified Actuary, with 2+ years General Insurance experience. Familiarity with Commercial, Personal or Specialty Lines business. Familiarity with the Lloyd’s market. Exposure to Internal Model / SCR / Model Validation projects. High-level knowledge of Remetrica or Igloo. Experience of using VBA, @Risk or ‘R’.